Little Pisa – the baby of the herd – has never been that keen on human contact. Elephants are very much like humans in this regard. They have very distinct personality traits that manifest from an early age. Right from the very beginning, Pisa was wary of the “two-legged creatures” in her life. For a long time she wouldn’t tolerate anyone coming near her, let alone touching her. But at just over a year, little Pisa has come leaps and bounds in the “trust” department. There are now a select few people she deems fit to touch her, but she’s very clear about how and where. It has to be exactly on the line where her ear and head join, and it must be a scratch. No airy fairy touching or rubbing will do. The really sweet thing is that if you do manage to get it right, she literally falls into a daze. And if you stop she nudges you until you carry on. Joe flew the coop towards the end of last year, but he still returns from time to time to say hi. Although we’re starting to think that these visits aren’t just because he misses his old family. While he does enjoy “chewing the fat” with his mates at Camp Jabulani, he also has ulterior motives. The first one being to show off in front of his new “wild” buddies, who he brings back with him to camp. Like a gang of unruly teenagers, they invariably set about yanking up the overflow pipe that leads from the water tank to the dam. And when they’re not actively pulling it up, they’ll just lean on it. The result being some flourishing bushes, and an often-soggy stable ground. Joe hasn’t lost his taste for lucerne – the sweet, nutrient-packed grass we feed the elephants at camp – either. Last week he timed his visit perfectly to coincide with dinner. At the end of the day the elephants line up outside their stalls, which are prepared with fresh bedding and troughs of lucerne. Joe nonchalantly hung around near the back of the queue, and the minute the grooms opened the gates he ran to the front and barged in ahead of the rest of the herd. We were all so gobsmacked by his cheekiness that by the time we got to him he was at the far end of the stalls with cheeks bulging, and a trunk full of lucerne for the road. He then strolled off, completely unconcerned about the ruckus he’d just caused. 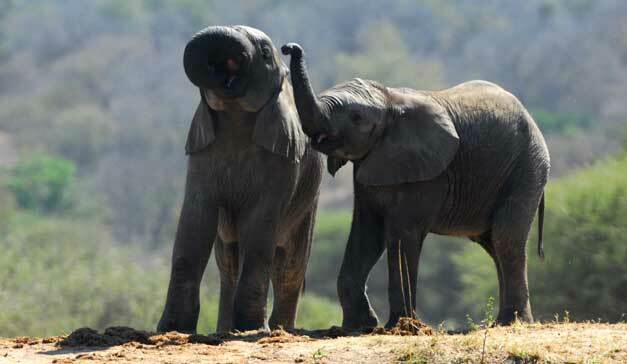 Elephants will not breed if their physical and psychological needs are not met. Considering that we have welcomed not one, but five babies to the herd over the last 5 years – they are clearly having their needs met on all levels. So much so, in fact, that we need to give our bulls hormone shots to make them less virile. Since Joe left the herd he’s become noticeably “friskier”, and recently he became a little too pushy with Setombe. We decided that since he was visiting regularly, it would be better if we gave him his hormone shot rather than risk possible ructions within the herd’s dynamic. Given how large elephants are, and how thick their skin is, we have to administer these shots by way of a dart gun. Getting an injection in the behind is undignified at the best of times, and to have to get one with a dart gun even more so. And with that he walked off. That was four days ago. No doubt he’s out there somewhere, licking his wounds and commiserating with his new family. Somapani has been plagued with sores on his back for last few weeks. At first we thought it was caused by pressure from his saddle, but even though we immediately stopped sending him on safari, he continued getting the sores. We called in two different vets, but they still haven’t been able to ascertain the cause. At the moment all we can do is keep his wounds clean and hope the vets figure out what the problem is. The really unfortunate thing is that poor old Somapani is a bit of a wimp when it comes to attending to his physical needs. Whereas all the other elephants are happy to stand still while we clean and dress their wounds, Somapani hops about as if we’re branding him with a red hot poker.